Tonight I'm going on a date with my wife. We are going to Texas de Brazil and then to see Avatar in 3-D. The mother-in-law is visiting so she's going to watch the kids! Should be a fun night! And sarcastically, it should be a fun night for the babysitter, too! 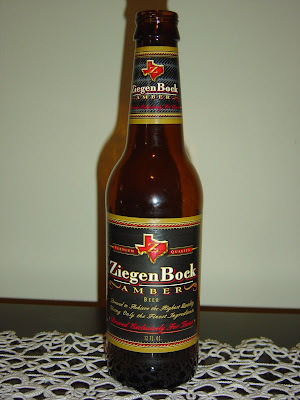 Today I am drinking ZiegenBock Amber brewed by Anheuser-Busch in Houston, Texas (find the link to them yourself if you want to visit their website). Lots of BIG talk for a beer "Brewed Exclusively for Texas". This beer came home from my friend's holiday trip to Texas. Apparently he thinks I'm worthy to check it out. The label says, "worthy of a Texan" so I guess they mean dudes with pickups and BBQ pits in their back yards and cowboy boots with spurs and horses and giant hats and... what other sterotypes? Grainy and caramel aroma. Malty flavors with corn and other grains. Sweet, and that sweetness seems a bit manufactured and with some light syrupy flavors. That's about it. Except for the dirty finish and slightly off aftertaste. Decent, non-descript, about what I expected. For sure, I bet. Something to take away the fire.